Short quotes and sayings are an easy way to spice up social media posts, writing assignments, business presentations and general conversation. Discover concise thoughts and statements about everything from love and romance to inspiration and success. 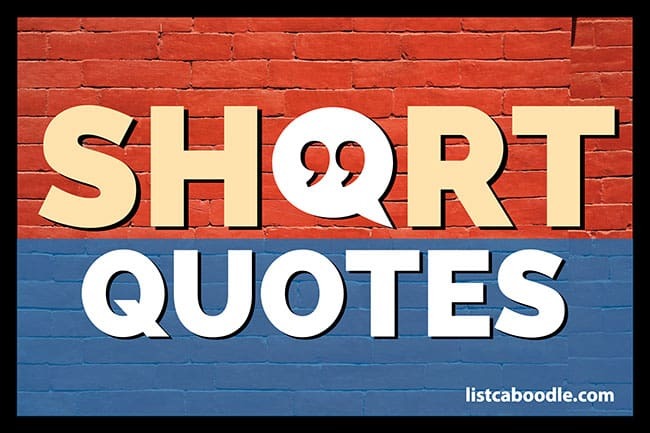 The poet Kahlil Gibran once said, “The obvious is that which is never seen until someone expresses it simply.” In that spirit, we present these short quotes from famous authors, artists, politicians, philosophers and celebrities. Don’t let words fail the true expression of your heart. These short quotes about love, relationships and romance can be used in Valentine’s messages, wedding anniversaries, birthdays and love notes. Add a special touch to your message of love! It’s far better to be unhappy alone than unhappy with someone — so far. These statements about everyday life speak to the common experiences we all share. Good for a smile or a knowing nod. The art of achievement is the art of making life—your life—a masterpiece. Living an experience, a particular fate, is accepting it fully. You only pass through this life once, you don’t come back for an encore. Speak the truth, do not become angered, and give when asked, even be it a little. Life is not a football game to be watched. The ability to influence people without irritating them is the most profitable skill you can learn. The best of all the preachers are the men who live their creeds. Experience has been a stern but excellent teacher. Fill up your life with a few good laughs every day. Without work, all life goes rotten, but when work is soulless, life stifles and dies. All kids develop at different rates and at different stages. If you don’t know where you’re going, any road’ll take you there. Sometimes a quote is best when it doesn’t take itself too seriously. This collection of quips stays light on it’s feet and packs a gentle punch! Truly how wonderful the mind of a child is. Tears are the body’s raindrops of emotion. I’m a slow walker, but I never walk back. In a twist of the famous adage, Mark Twain said “Humor is the good natured side of a truth.” These truthful statements are good for a chuckle or two. The difference between genius and stupidity is: genius has its limits. I love mankind … it’s people I can’t stand!! ′Classic′ – a book which people praise and don’t read. There are no good girls gone wrong – just bad girls found out. I would challenge you to a battle of wits, but I see you are unarmed! These short statements dive deep and leave us pondering. What is the meaning of life? Who will I become? Why do we exist? Find the answers below! Be where you are; otherwise you will miss your life. Our minds are the steering mechanisms of our lives. Be flexible so you can change with change. A man is but what he knows. At times, we just need a pat on the back and the thought that it all will be alright in the end. These short sayings will put a positive spin on your outlook on life. The more I help others to succeed, the more I succeed. A man’s true wealth is the good he does in the world. As my knowledge of things grew I felt more and more the delight of the world I was in. All human beings react positively to praise. Take calculated risks. Act boldly and thoughtfully. Be an agile company. Don’t find fault, find a remedy; anybody can complain. I believe that nothing in life is unimportant every moment can be a beginning. I enjoy every day, because I choose to. Cheer up, keep your spirits high, things are bound to get better! You’ll never achieve real success unless you like what you’re doing. Find motivation in these words; empower yourself to succeed. These short quotes will inspire you to greatness! As you know, life is an echo; we get what we give. God put you on this earth because He loves you and He has a plan for you. If it fails, admit it frankly and try another. But above all, try something. Find people who will make you better. I think there is something, more important than believing: Action! Now I look beyond what I can’t do and focus on what I CAN. The noblest question in the world is What good may I do in it? It’s fun to do the impossible. To reach a port, we must sail – sail, not tie at anchor – sail, not drift. Every man is potentially great, the difference lies in exploiting ones inner potential. They say that friends are the family you choose. These short quotes describe the friends and friendships we hold so dear to our hearts. Peace, commerce, and honest friendship with all nations – entangling alliances with none. Friends should be like books, easy to find when you need them, but seldom used.